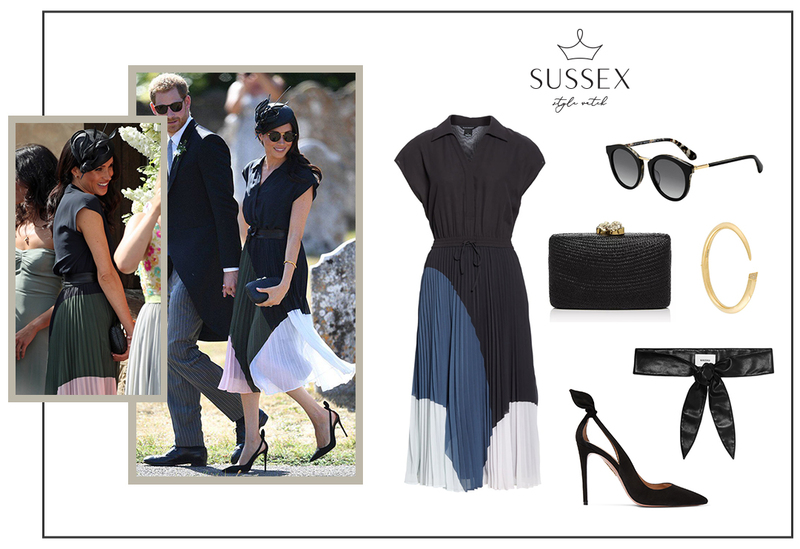 This look is one Meghan wore when she and new hubby, Prince Harry, attended the wedding of Charlie van Straubenzee in Surrey last August! The society wedding actually took place on Meghan’s 37th birthday, so there was certainly a lot to celebrate that day. Charlie and Prince Harry have been life long friends – they’re so close, in fact, that Prince Harry served as best man in the wedding! 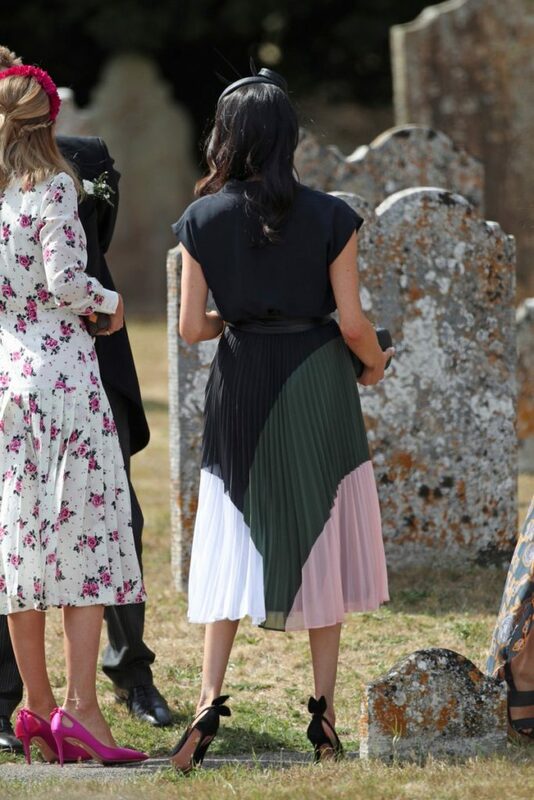 For the morning wedding ceremony, the Duchess of Sussex chose a colorblock pleated dress by Club Monaco. Her dress featured black, olive green, pale pink and white. While her exact color combo is no longer available, Club Monaco released the exact same dress in a new set of colors for this season! I actually prefer this season’s colors of black, blue, mint and white. You can shop this exact dress here and here! Meghan styled this midi dress with a black leather knot-tie belt by Miu Miu (sold out – similar under $100 here! ), her favorite black Aquazzura Deneuve pumps and a straw black clutch by Kayu. The priciest part of her outfit was actually the sleek pair of sunglasses she wore! They are this round style by Linda Farrow Luxe, which are sadly no longer available… but I did find this Kate Spade pair with a similar look for less!